This is precisely the definition given by Shantideva. When you become enlightened, you are enlightened to your Buddha Nature. Mara can no longer touch you. Demonizing humans and individuals is NEVER good. I could write countlessly, endless pages, but there is only no need for that. Criticising and trying to stand in each others' way is infinitely less helpful than stating positively, what you think is good. The only beings that are being demonised in this thread as far as I can see are....demons. The truck that hits you if you stand in the middle of road has no ultimate separate existence. That won't stop it killing you. and one should attain wisdom by taking steps carefully. Again, what I described is the best method. Meditation practice, these things. 'The best way to clear muddy water is by leaving it alone,' It has been said, and this is true.. It is infinitely better to take positive, creative action. When the mind is transformed, literally -- Yes, literally -- one is healed from afflictions. When one is healed, one is able to do the same. Practice with all of one's heart -- and, inward meditation partly; outward acts of kindness and merit. As Mila said, do not meditate without good karma. Best wishes from all my heart. Sorry i can't read your post it does not exist and neither do you or I. Pleas study reflect and meditate. As you choose and wish. It is much better - always - to speak truthfully, clearly and honestly. . . than to speak any other way. It really is always important to speak truthfully. * Buddhism of Wisdom and Faith: Discussion on Demonic Realms (section 51, farther down the page). This is specifically about demons and not hungry ghosts. I also found this thorough document from FPMT covering food offering practices, including for hungry ghosts and beings in the hell realms. Thubten Chodron writes about handling fear here. She also has many other articles and talks on the subject, on the left of the page. I think this would be a great opportunity to discuss fear. Why do we feel fear when encountering demons or hungry ghosts, real or imagined? And how can we counterbalance fear in general, so it doesn't color our response? I still recommend a mantra or buddha name. 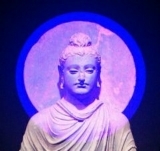 Fear creates a duality, and thinking of a buddha disrupts that process. And saying a buddha's name or mantra can connect a ghost/demon in a far worse situation than we are to the Dharma. What could be better, given the circumstances? Last edited by Mönlam Tharchin on Fri Sep 21, 2018 5:50 pm, edited 1 time in total. To say that demonic entities only exist in the mind is meaningless. It is true to the extent that all beings, events and phenomena have no independent existence. But as HHDL quoted when asked if the Dharmapalas exist 'they are as real as you are'. No more, but no less real. How is it meaningless? Every teaching I know says we don't purify and pacify demons that exist inherently outside our mind/ experience. When HHDL says demons are as real as your own mind, it's actually a tricky answer. Because your mind is also not any more real in a solid sense. Which is not to say it has no importance. But the whole understanding of demons as being NOT inherently existing outside and separate from oneself is one of the most important teachings of Buddhism and is the crux of the matter. Last edited by TharpaChodron on Sat Sep 22, 2018 4:20 am, edited 1 time in total. The crux of the teaching is also that you do not have existence outside of THEIR minds either. But in conventional terms you have a reality. You are reading these words. If you stand in front of a truck the collection of skandhas that represent you will be somewhat modified and rapidly. So what you are saying is that for a number of reasons you are choosing to believe that demonic beings are even less real than you. That even in terms of conventional reality they have no existence. That they exist as a subset of your mind..in a way that your friends and trees and clouds do not. Which is a perfectly reasonable conclusion. But not one supported by the experience of many people, both Buddhist and non Buddhist, including me. They are as real as you are, no more than that...but they are not less real than you are. The same is, of course, true of Dharmapalas too. Too see disembodied beings as merely an aspect of our 'minds' (itself a problematic concept) is a modern innovation, and one not in accord with some traditional teachings. Better safe than sorry when it comes to this sort of thing. It's very hard, when you're not expecting it, to A) be prepared for extreme fear, and B) still be able to do something potentially beneficial for another being. Mantras have helped in every encounter I've had, whether in a dream or awake, whether I have had a correct view in that moment or not. That's what I want people to remember at least. fOr a while last year i was chanting 6-8 hours a day; walking 12+ miles, and sleeping very little. not, none. but very little. once, I chanted 40 hours straight... It's nice to have this energy. Argument is incredibly injurious in general. So this is not my intent. I would preface with -- every good wish,.. Please do not say to anyone, "your existence is dependent on...." etc.. This is not beneficial or true in any sense. it is akin to people saying how strong or great the Devil is.... instead of this; why not focus on Buddhas and Bodhisattvas. And even that which has gone will return. do not tell people how evil the world is. . . . . Anyway -- this is my last post in this thread. Buddha in countless places says; this place here is the Pure Land. Still looking over the materials linked here. Thank you all, especially Monlam. This is very interesting.